How did U.S. President Donald Trump go from "People have been talking about the two-state solution for so many years now; it so far hasn't worked" in February to last week's "I like a two-state solution. That's what I think works best"? The answer, as with so many things involving Donald Trump, is that we just don't know. But one thing is certain: He didn't arrive at this new position after looking at any actual maps of what Israel would look like if a Palestinian state were created. Because nobody who realizes that establishing a Palestinian state would reduce Israel to just nine miles wide could possibly advocate such an outcome--except, of course, somebody who seeks to facilitate Israel's destruction. Take a look at a map of Judea-Samaria (the "West Bank"). Notice the cities with the largest Palestinian Arab populations. Hebron is first, Nablus (Shechem) is second. The third largest is Tulkarm. The fifth largest is Qalqilyah. Obviously, Tulkarm and Qalqilyah would have to be included in any Palestinian state. Now notice where Tulkarm and Qalqilyah are located. They are on the far western edge of what would be a Palestinian state. They are a little more than nine miles from the Mediterranean Sea. That is, nine miles of Israel. Meaning that if "Palestine" is created, then Israel will be just nine miles wide at its mid-section. That's not as wide as Washington, D.C. Or even the Bronx. Nine miles wide. An enemy army would be able to cut the country in two in a matter of minutes. A terrorist with a shoulder-fired rocket, standing inside the border of the new Palestinian state, would be able to shoot down a plane landing at Israel's major airport. Pedestrians in Israel's capital, Jerusalem, could be targeted by Arab snipers--as they were before June 1967. There's a very important reason why advocates of a Palestinian state call their solution "the two-state solution," instead of "the nine-miles-wide plan." The phrase "two-state solution" sounds fair. You have two warring parties, so you give each of them a state. And "solution" sounds so promising; a problem is solved. But the term is deeply deceptive because it doesn't tell you anything about the size of the two states--so you have no idea whether that would "work best" or not. "Two-state solution" is nothing more than a slogan. A sound bite. An appealing phrase with no content. If you add some content--if you call it what it really is, the "Nine Miles Wide Plan"--then you understand what a Palestinian state actually would mean for Israel. And with that information, you can make a much more educated decision as to whether or not you want to support it. Palestinian advocates don't want you to have that information. They don't want you to think it through, to look at a map, to see if it's genuinely a safe plan for Israel's future. They want to lull you into thinking that it will bring peace, and if that isn't enough to convince you, then they will try to scare you with the old "demographic time bomb" threat. 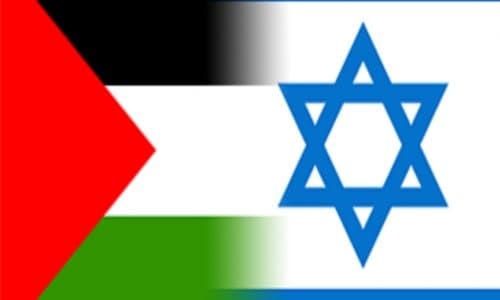 That's the claim that because of the high Arab birthrate, Israel will have to agree to a Palestinian state or it will become an apartheid-like ruler over the Palestinians. Nonsense. Yitzhak Rabin resolved that problem way back in 1995, when he withdrew Israel's forces from the cities where 98 percent of the Palestinians reside. Now they are residents of the Palestinian Authority, and they vote in Palestinian elections. They will never be Israeli citizens, will never vote in Israeli elections, and will never threaten Israel's Jewish demographic majority. There may be no solution to the Israeli-Palestinian conflict in our generation; not all international conflicts have one. But certainly whittling Israel down to nine miles wide is not the answer. Would somebody please show President Trump a map?